Some ad campaigns don’t work. 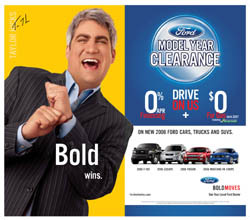 Like the recent mistake of putting an American Idol winner in a retail automotive ad. Scott G comments on Ford’s chopping of Taylor Hicks. Taylor Hicks is famous. As the 2006 winner of “American Idol,” there are marketing opportunities for Hicks that can’t be beat. His undisputed ranking as the best karaoke singer in America created a high recognition factor that was too much for some companies to pass up. It seems that the folks at Ford Motor Company were eager to move some sheet metal out of their dealerships, so before you could sing a line from The Beatles’ “Baby You Can Drive My Car,” Hicks was starring in a commercial for a sizzling summer sales spectacular. Actually, it was called the “Drive on Us” program and its big feature was a Ford Credit offer of zero percent financing. 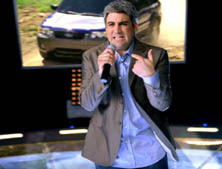 Certainly nothing says “zero percent” better than Taylor Hicks singing and dancing. I can handle Hicks’ imitation of Michael McDonald. I have nothing against his bowl haircut (check my photo and see why I make fun of no one’s hair choices). I don’t even mind the fact that his dance moves are not quite as graceful as Rosie O’Donnell on a skateboard. But just what does he have to do with the Ford brand? Yes, I realize how old fashioned this sounds, but I feel it’s important to have a tie-in between celebrity and product. When the commercial began at the beginning of June, Hicks sang throughout the spot and was on-screen for about fifty percent of it. By the end of June, Hicks was down to about a quarter of the running time and the announcer was talking over an instrumental version of the song, with just a couple bits of Hicks’ vocalizing. By the middle of July, the announcer was speaking over the instrumental tracks for 90% of the commercial, with Hicks appearing out of nowhere at the end for a few seconds of warbling and lumbering. Which had even less of a tie-in with the product than in the original spot. In the interest of assisting the marketing departments of U.S. corporations, here’s the start of a handy list of possible advertising associations utilizing Taylor Hicks. If you feel that he must also be the “after” spokesperson, make certain you budget in enough money for some CGI. So, what’s next for Ford? They have Kelly Clarkson in their ads. Well. Okay. Let’s assess that bold move. Better singer. Better dancer. Cuter. But again, what is the tie-in between celebrity and product? 1) During this period in 2005, Ford sales were markedly up but this year slumped 35% (including the first month of the Hicks spot). 2) The initial commercial might have been a good promotion for a Taylor Hicks album or tour, but was a disaster as a marketing effort for automobiles. 4) I wasn’t writing this column when the horrifying Toby Keith spots were running. 5) I prefer singers who don’t copy the style of other artists. 6) One of my cars is a Focus, and it’s a damn fine vehicle so far (44,000 miles). Editor’s Note: images are courtesy of the Ford media/press website.